30/07/14 Over Area 4 this morning Paul Bright Thomas saw a Hobby flying over his garden. 25/07/14 A Kingfisher was seen flying over the bridge crossing the Emm in Area 10 (DintonPastures) to the rear of the Juniour Rangers area by the main car park..
24/07/14 An early morning visit to Area 1 (Heathlake) and a scan of the lake, produced positive signs of breeding with Coot, Moorhen and Mute Swan all wiith young. 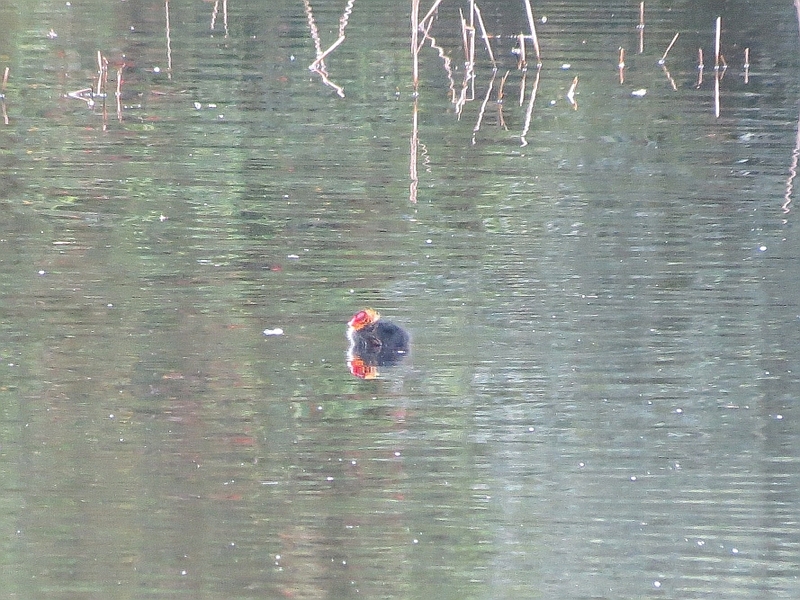 The usual assortment of Mallards were also in evidence with Great crested grebe and a male Tufted duck. A solitary Black headed gull and a Grey heronwere on the island with a Grey wagtail feeding on the sandy beach area. The woods were a bit less fruitfull with Green woodpecker and Nuthatch, a callingMistle thrush, Jay and numerous Robins and Wrens. Also visited was area 2 behind Tesco's, highlights here were 5 Swallows flying over the fields. Several Red kite were also enjoying the thermals .Late evening (20:20) watching over Area 4 by Paul Bright Thomas and an adult Common Gull flew over heading S and 7 Swift were circling overhead. 23/07/14 A bit of a suprise this morning with what can only have been a Whitethroat moving through the trees in my area 5 garden. 22/07/14 Paul Bright-Thomas had a Ring necked Parakeet fly over his garden early at 06:30 this morning heading S.
20/07/14 In Area 4 to the rear of the balancing pond a Grey Wagtail was seen in the Emm. A male Blackcap was feeding young , returning numerous times with insects. 19/07/14 In Area 4 , Paul Bright-Thomas had a juvenille Goldcrest calling loudly from a Blackthorn bush in his garden. 15/07/14 Upstream of Kingfisher Bridge in Area 4 at 07:30 this morning theKingfisher was perched on the pipe that crosses the Emm. It saw me and flew upstream towards Meadow Road Bridge. Also seen were 2 Mistle Thrush . 13/07/14 During the Balsam Bashing this morning a family group of Grey Wagtail were seen. 2 Adults and a juvenille were on the banks of the Emm behind Meadow Way. A Grey Heron flew over and a Moorhen was seen on the river. 10/07/14 Today the birds seemed to appear in numbers. A flock of Greenfinches were flying around my Area 5 garden, a family party of Goldfinches adults and juvenilles were feeding at the Sunflower hearts . Blackbirds adults and juvenilles were feeding off the lawn. By the afternoon Swifts numbers had reached double figures. In Area 10, 3 Buzzards were riding the thermals over Area 10. 05/07/14 A later walk along the Emm this morning paid dividends a Kingfisher was seen flying up and down the Emm in Area 5 behind Morrison’s . This is the first time for 6 weeks. In Area 3 over Lidl in Molly Millars Lane, 3 Red Kite were riding the thermals. A solitary Pied Wagtail was picking up bits from the car park. The current spell of warm weather seems to show no sign of going away. Blue skies have proved good for Raptors withBuzzard and Red Kite . Swifts allthough not in huge numbers can be seen and heard feeding overhead.Starlings seem to have succesfully put in a second brood , and the pair of Coot on the Balancing pond seem to have produced at least one offspring..
01/07/14 Area 5 behind Morrison’s was fairly busy on my walk to work this morning. The Green Woodpecker has put in a welcome return and Grey Heron is a regular flyover . House Sparrow are nesting under my neighbours eaves, and a solitary Chaffinch also seems to have returned following a 4 week absence from my notebook. 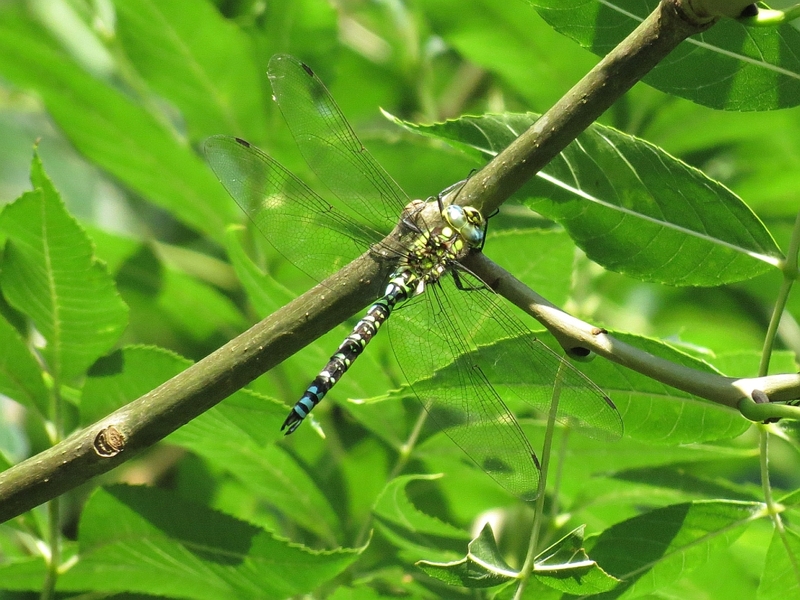 Before flying high into the trees,this male Southern Hawker Aeshna cyanea was hawking for insects near Ripplestream Bridge in Area 4. During the Balsam Bashing in Area 3 off Ashville Way today several Butterflies were seen feeding off the wild flowers, Meadow Brown Maniola jurtina , Gatekeeper Pyronia tithonus and Small Skipper Pyronia tithonus. 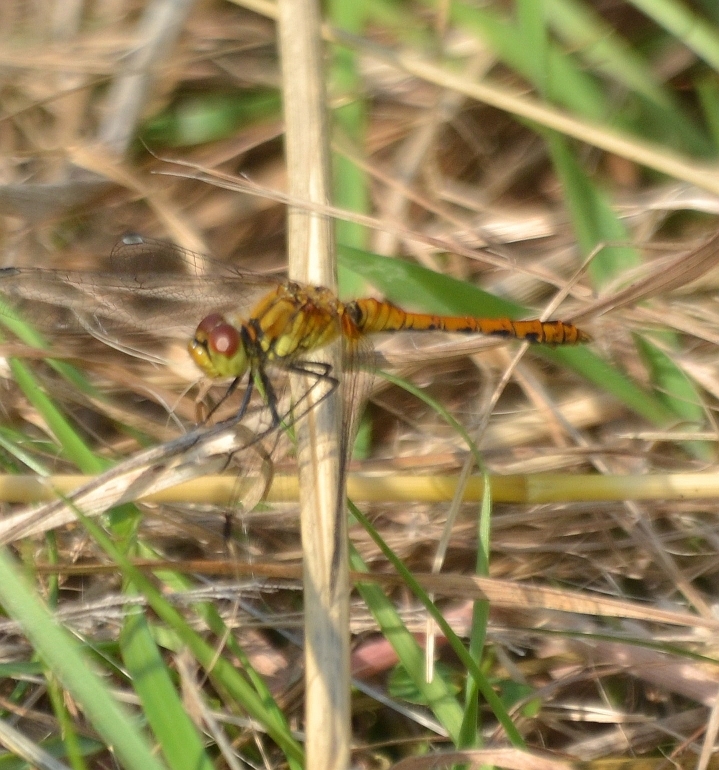 An as yet unidentified Dragonfly was seen along with numerous male and female Banded Demoiselle Calopteryx splendens. 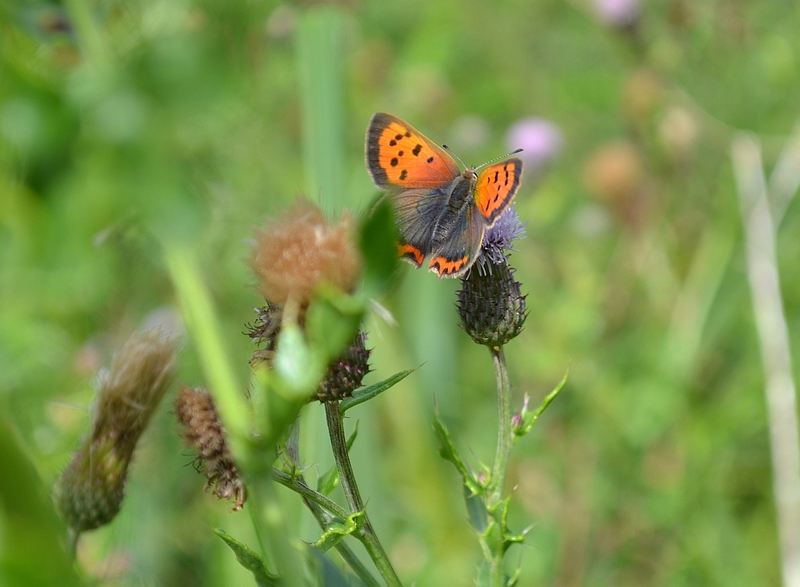 In Area 5 a Small Copper Lycaena phlaeas was seen along with several Comma Polygonia c-album. Lunchtime today was spent in Area 8 on a Butterfly hunt. 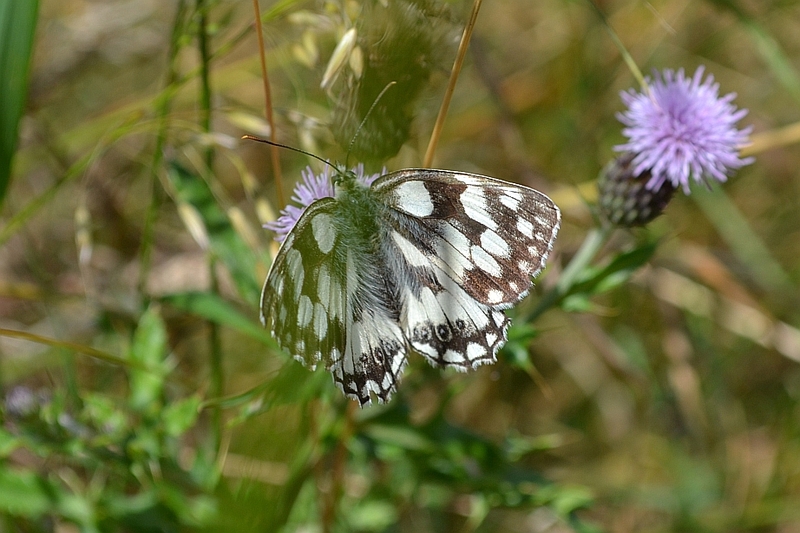 2 of the target species Small Copper Lycaena phlaeas and Marbled White Melanargia galathea were seen along with 5 other species. This brings the Foteb list to 18 species for the year. 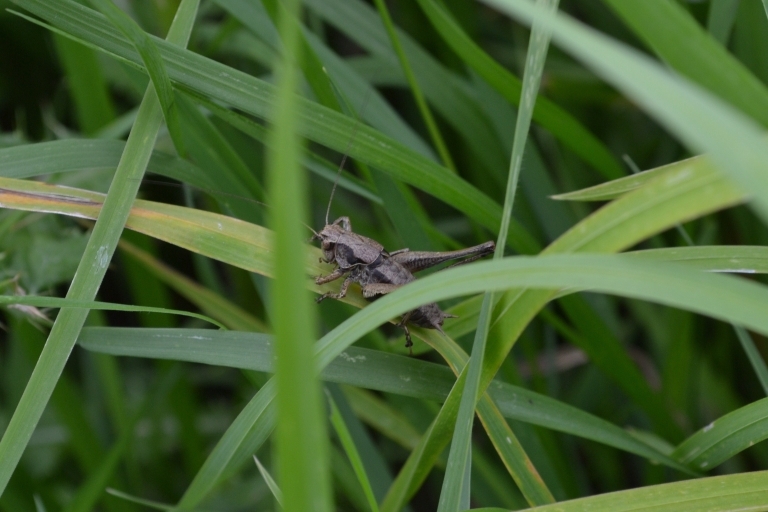 Another visit to Area 10 at lunchtime today produced aDark bush-cricket Pholidoptera grisoapterai. 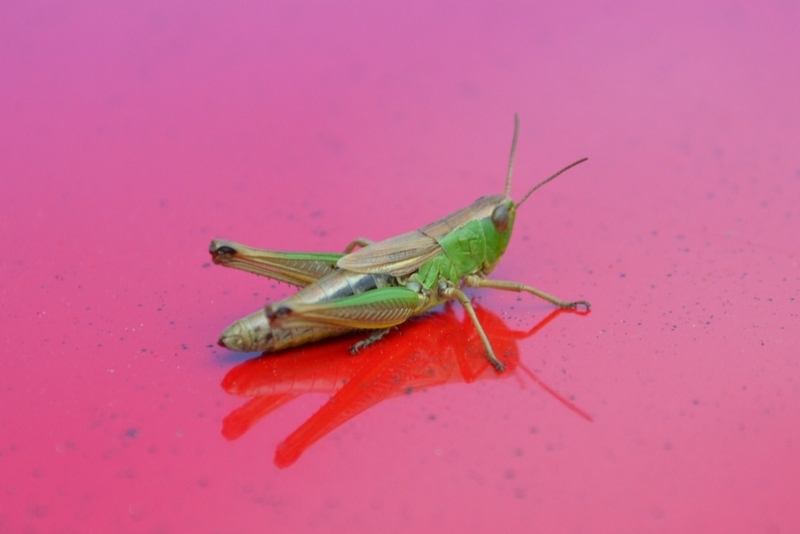 A quick stop off in Area 10 at lunchtime today and Orthoptera (Grasshoppers and Crickets) were stridulating in the Lavell's Lake car park field. Seen and heard were Roesel's bush-cricket Metrioptera roeseliand Meadow Grasshopper Chorthippus parallelus. 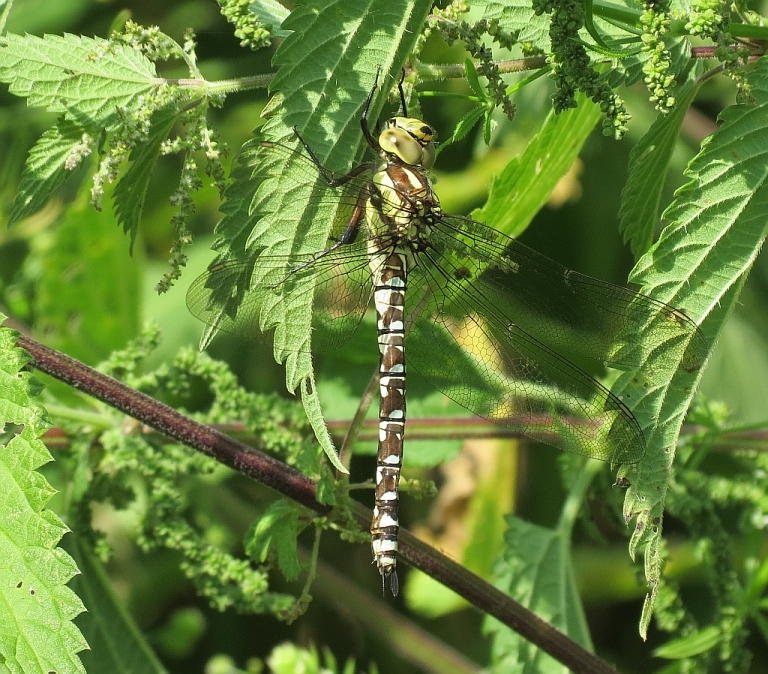 On the way home this afternoon, near Dragonfly Bridge was this Immature female Southern Hawker Aeshna cyanea. A large, inquisitive Hawker usually seen individually. It may fly quite close to investigate observers. 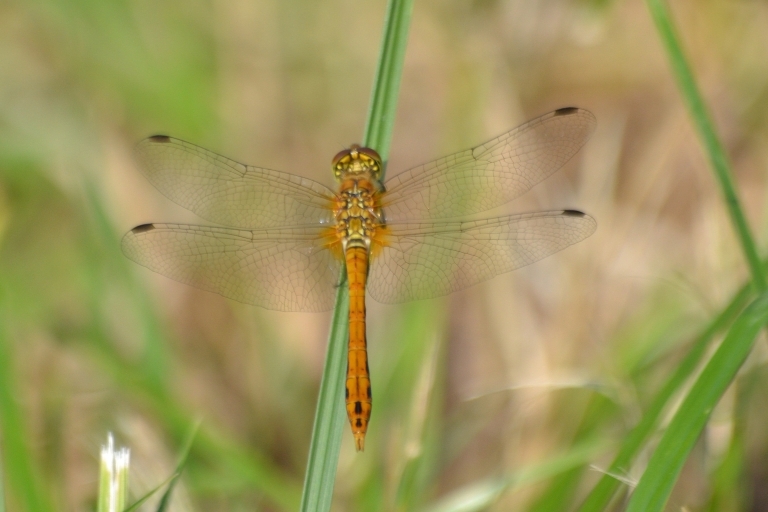 This brings the FOTEB Dragonfly and Damselfly list to 11 species for the year. Despite the threat of rain there was still Butterflies on the wing today. 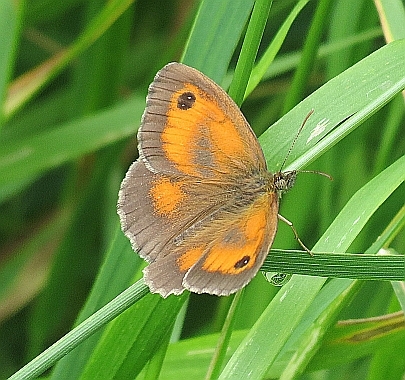 In the Wildflower Meadow Ringlet Aphantopus hyperantus, Meadow Brown Maniola jurtina and a Skipper species were seen. Alongside the river Comma Polygonia c-album, Meadow Brown Maniola jurtina and the first Gatekeeper Pyronia tithonus of the year was seen. This brings the FOTEB Butterfly list to 13 species for the year. In Area 7 this morning, Butterflies were enjoying the sunshine. Seen were Ringlet Aphantopus hyperantus, Comma Polygonia c-album and Meadow Brown Maniola jurtina. In Area 8 off Forest Road Common Yellow Toadflax Linaria vulgaris is in full bloom . One of its common names is Butter and Eggs, it has "snap dragon" like flowers. 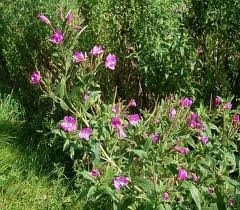 Various forms of Willowherb , can now be seen along all areas of the Emm. The 2 most common forms are Great Willowherb Epilobium hirsutum and Rosebay Willowherb Chamaenerion angustifolium. 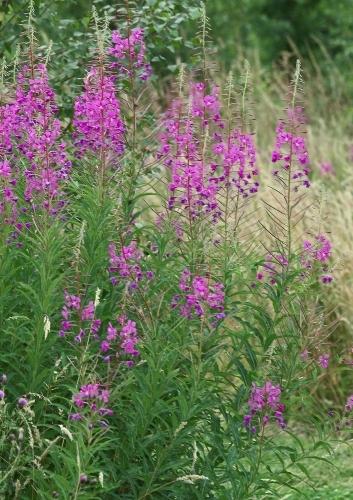 Great Willowherb is a large plant covered in soft, downy hair. The small purple-pink flowers have creamy centres and the lance-shaped leaves sit opposite each other on the stems itt flourishes in damp ground. Rosebay Willowherb has tall, pink flower spikes that can often be seen crowding together in thick stands. . A successful coloniser, Rosebay Willowherb has grown in number from a scarce woodland plant to a ubiquitous flower. 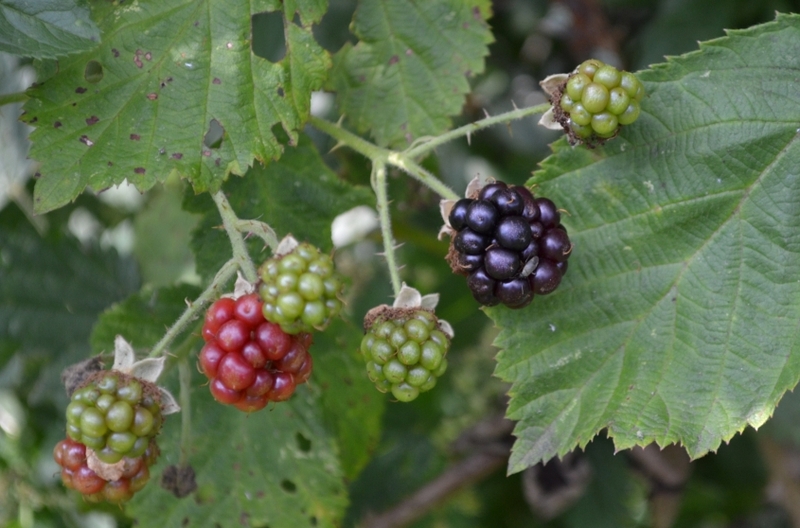 With the warm weather continuing Blackberry Rubus fruticosus is starting to ripen.The picture shows ripe,ripening and unripe fruit. Along the Emm you can now see, one of my favourites Meadow Sweet Filipendula ulmaria emerging . 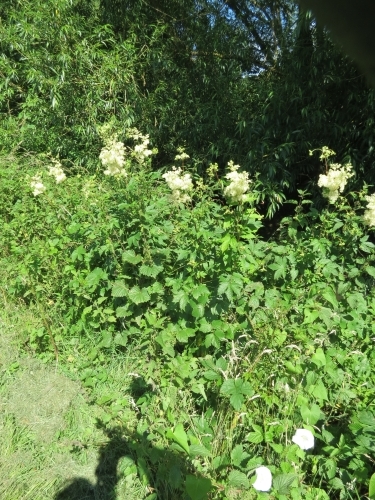 Meadowsweet is a member of the rose family that favours wet habitats such as ditches, damp meadows and riverbanks. 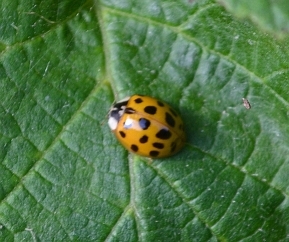 Its leaves are sometimes covered with a bright orange rust fungus. Meadowsweet flowers from June to September, its sprays of tiny creamy-white flowers standing atop tall stems. These were in Area 7 (Emmbrook Fields). A Pleated InkcapParasola plicatilis. was seen in Area 5. 2 Roe DeerCapreolus capreolus were seen in Area 2, behind Tesco's this morning by Pat Taylor. A very small fish was seen swimming under Ripplestream Bridge in Area 5 this afternoon. As yet unidentified. Whilst pulling Balsam in Area 7 by Emmbrook School this morning, 2 large fish were seen to swim up the Emm,seen by Sue Farrington and Fran Stickler. One at least was believed to be a PikeEsox lucius.